encouraging.com: Know Your Enemy! Satan The Trickster! Know Your Enemy! Satan The Trickster! 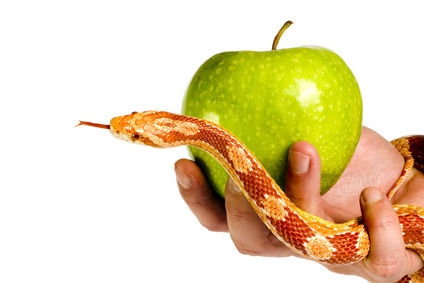 Satan didn’t openly tempt Eve to disobey God. He caused her to question whether God really told her not to eat from any tree in the garden. He tricked her into believing that God wouldn’t really kill them for eating from the tree that was in the middle of the garden. His trick worked on Eve. He can trick us too. We must recognize his tricks. How crafty he is! Does the Bible ever say, Don’t live together before you are married? Surely you know that if you really love someone a piece of paper isn’t needed. What difference does it make? Begrudging this practice is old-fashioned and judgmental. Besides, we are going to stay together forever. Uncle Sam takes too much of my paycheck. It won’t really be stealing if I fudge a bit on my charitable giving. Do I really need to declare all of my earnings? My husband takes me for granted. Surely God doesn’t expect me to remain true to someone who cares as little for me as he does. The clerk gave me too much change. Is it my fault that she can’t count? The Bible doesn’t say we should go to church to be a Christian. I worship God in my own way and on my own time. Some Sundays it is just better for me to stay home. On and on goes the master of trickery. How subtle are his ways. He helps us talk ourselves into disobedience to our Father. We must rely on God’s Word for the truth. Whether you are a student, career woman, stay-at-home mom, or senior citizen, you must be aware of Satan’s tricks. He is the master of deceit. Don’t listen to him. He doesn’t want your life to count for Christ. He has won a battle if he tricks you into making excuses for your sin. Ammunition for today: Submit yourselves, then, to God. Resist the devil, and he will flee from you. Come near to God and he will come near to you (James 4:7,8). Dear Father, Teach me to recognize Satan’s tricks. Draw me close to You.